To be honest, I am not very picky when it comes to body moisturizers and such. I do have stubborn dry areas like, my elbows and lower legs. But really, most of the time my skin's pretty normal. I use body lotions occasionally but I don't use body butters as often as I should. When and if I do, I am pretty content with any-just as long as they have a pleasant fragrance and don't leave behind a greasy residue. Hate that! 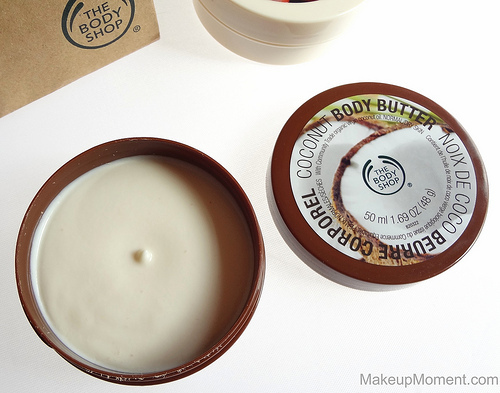 Coconut Body Butter: I love products that have a coconut scent so naturally, I just had to get this one. This body butter smells so yummy! If you are a coconut fragrance lover, this one will not disappoint. The scent is deliciously tropical, and not artificial at all. It even lingers around for awhile. The coconut body butter contains ingredients like fair trade organic virgin coconut oil, Shea butter, and cocoa butter. All great for softening the skin. The consistency of this body butter is semi-thick, and it goes on wonderfully. It absorbs pretty quick, too. After I have applied this body butter, my skin feels so smooth and lovely. I really like this one. Shea Body Butter: If you are one that has super dry skin chances are, you are going to love this Shea body butter. It's very moisturizing, and has a thinner consistency than the coconut body butter does. This one feels so good going on, and I just can't get enough of the warm nutty scent. So soothing. The Shea body butter contains ingredients like fair trade Shea butter, cocoa butter, beeswax, and babassu oil. All power ingredients to really moisturize the skin. I like applying this body butter to my super dry areas such as the elbows. Works wonders! Don't get me wrong, the coconut body butter is moisturizing but, I like to reserve this Shea one for my more stubborn drier areas, as I find it to be much more effective at softening. Overall, I think these body butters are a nice treat for your skin. They do the job, they contain skin smoothing ingredients, and the body butters are cruelty free. Gotta love that. I also really appreciate that they both sink into my skin so quickly, and don't leave behind an uncomfortable, tacky residue. They last a long time on, too. I am especially loving that these are miniature sizes. Of course, I will most likely purchase the full sizes of these sometime in the near future but I gotta admit, I love carrying these around with me in my purse, when I am on the go. Super convenient. A bit of product goes a long way so, I am sure these minis are going to last awhile. These body butters are a winner in my book, and I think they are definitely worth a try. 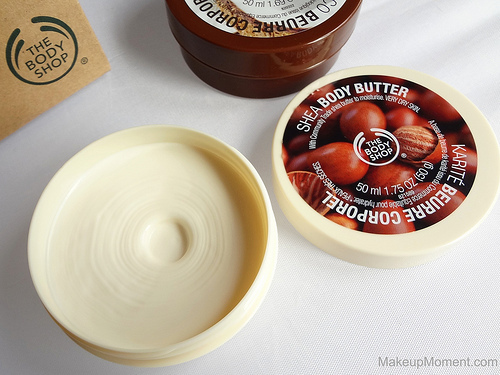 What do you all think of The Body Shop's Body Butters? Which are your favorites? Disclaimer: I am not affiliated with any of the companies mentioned above. I purchased these products for my personal use. I love the scent too...and they're moisturizing for me!!! thanks for the review. I absolutely adore your blog. Do you have a TJ Maxx store nearby? 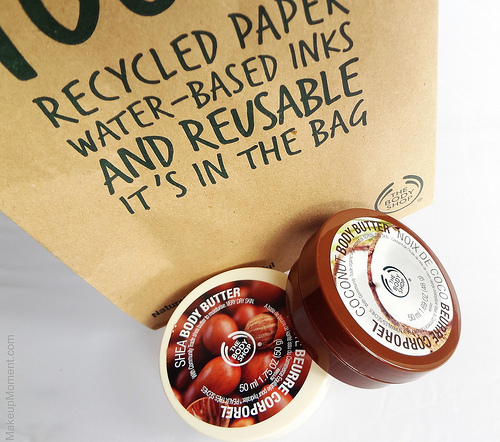 They usually have lots of The Body Shop products at a discounted price. I do! I was actually at one 2 days ago and, I did spot some products by The Body Shop. But they were items that I really wasn't interested in. I even spotted an Essie nail polish! But the shade wasn't something I would have picked up :( I don't have much luck in TJ MAXX when it comes to makeup. I miss out on the good stuff, LOL! Is is def hit or miss! I have the mini coconut one, and I only have about 1-2 uses to get out of it. 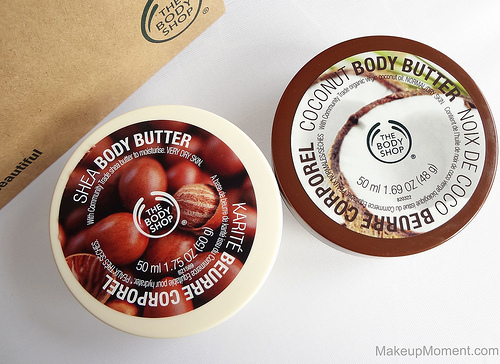 I really like the coconut scent, and they are moisturizing too!